Back in the day, Mr. Show ran a series of brilliant fake commercials for the combined mustard/mayonnaise products mayostard, mustardayonnaise, and mustmayostardayonnaise; these ads spoofed the perennial mania for combining, in one unwieldy package, complementary food items too long segregated by the cruel dictates of the free market. Let's face it: Some things go together like peanut butter and chocolate, peaches and cream, and McGovern and Eagleton. So in the proud tradition of Smucker's Goober (peanut butter and jelly in the same bottle!) 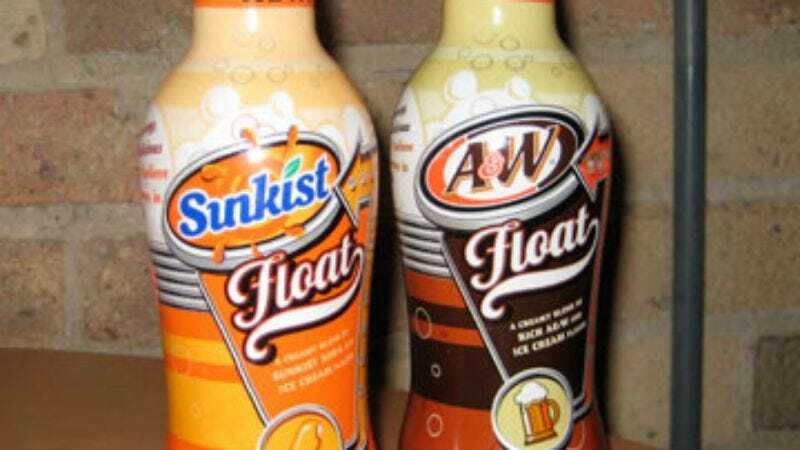 comes A&W;'s Float and Sunkist Float. No longer must mankind waste precious seconds painstakingly finding glasses, then scooping ice cream into said glasses, before finally topping them off with frosty root beer or, um, Sunkist orange soda. Who has the time for all that? The Queen of England? These floats promise a time- and perhaps even life-saving combination of "rich A&W;" or "Sunkist Soda" with "Ice Cream Flavor." The key word in that last sentence is, of course, "flavor." These floats aren't promising ice cream, but rather a vague, fuzzy, wildly unsatisfying approximation. Think of it as a slightly more palatable version of mustardayonnaise. A quick note on packaging: The stylishly designed retro bottles these floats come in are surprisingly heavy and substantial. One doomed Sunkist Float bottle quickly ripped through a plastic bag, shattered, and emptied its contents onto the sidewalk mere seconds after being purchased. So even if the taste of the A&W; Float leaves you cold, it may prove useful as a murder weapon, or a tool for good old-fashioned bludgeoning. Taste: A consensus formed rapidly about the taste of both misbegotten floats. Most tasters agreed that the Sunkist Float tastes like a melted creamsicle. When asked if this was good or bad, one A.V. Clubber answered, "Do you like room-temperature creamsicles? If you saw a creamsicle melted on the sidewalk, would you stop to lick it up?" We're gonna take that as a "bad." The A&W; Float fared no better, with most testers agreeing that it smelled like Bailey's Irish Cream and tasted like a sickly-sweet mixture of melted caramel and heavy cream. Incidentally, while neither drink has much carbonated snap—though upon opening, the Sunkist Float did explode all over Kyle Ryan's work area—a good bit of weird science was involved in trying to recapture the trademark foam and fizz of the real thing. In addition to such folksy ingredients as propylene glycol alginate and phosphoric acid, both floats contain nitrous oxide (a.k.a. laughing gas) as a foam-generating agent. Judging by the response to these bad boys, it looks like the old-fashioned root-beer float may not be a thing of the past after all. • "Oh, yuck. It's foamy, thick, and nasty-looking. Even for something with a Sunkist base, it's still got a really unnaturally bright color." • "If you could freeze it, it wouldn't be that bad." • "It's almost nauseatingly sweet." • "The point of a creamsicle is the cold and the texture. Drinking something this cloying and sugary is just kind of repulsive." • "Tastes like summer at grandma's house." • "Okay, that's something I never have to taste again." • "If you left a can of Sunkist open on your kitchen counter for a day, then poured melted Blue Bunny vanilla ice cream into it, it'd taste about like this." • "Oh my God, it's so thick." • "It doesn't taste too bad, but it's like drinking something melted." • "It looks like stale café au lait. Like the dregs of someone's Starbucks drink." • "It's also roughly the same color as the cheeseburger in a can." • "Oh yeah, it's terrible." • "Have you ever had yogurt milk? It's sort of like that." • "Part of me feels like the contents of my stomach are coming right back out." • "Smells like Baileys, tastes like Baileys with no alcohol." • "A very poor approximation of what a root-beer float tastes like." • "Who could drink a whole bottle of this? It's so rich." • "Who would want to drink a bottle of something with the texture of gluey melted ice cream?" • "It's not that bad." • "Really? Try smelling it again. Take a deep, long whiff, and then try to drink some more of it. Ugh." Where to get one: Convenience stores, 7-Elevens.